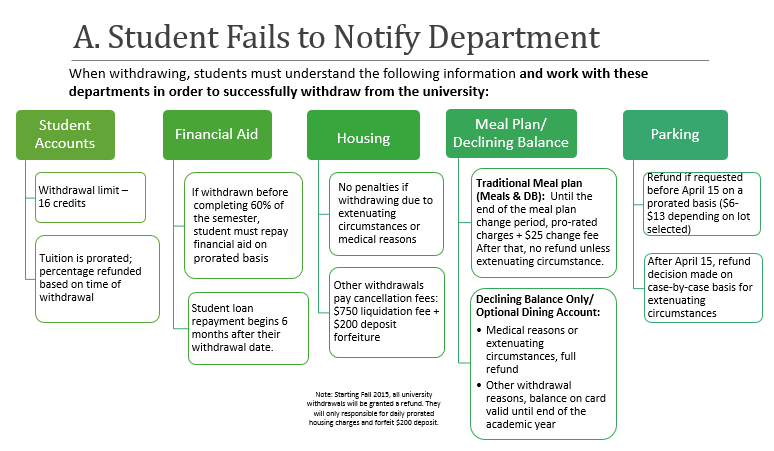 Students granted a Withdrawal with Extenuating Circumstances may have additional financial and administrative ties to University Housing, Student Accounts, Student Health Insurance, and other UNC Charlotte offices. Termination of registration by withdrawing does not release a student from other contractual obligations, such as housing, dining, and parking. Those contracts must be addressed separately with the responsible divisions. Students assume academic and financial responsibility for the courses in which they enroll and are relieved of these responsibilities only by formally terminating enrollment. Students who have withdrawn from the University are no longer eligible to reside in student housing, participate in student activities or benefits, or have access to facilities or programs operated for the benefit of students. **Please note that it is not guaranteed that students will receive any refund for services paid for (housing, dining, tuition etc...). Students who are approved for a Full Withdrawal with Extenuating Circumstances might be eligible where as students who are approved for a Partial Withdrawal with Extenuating Circumstances are not. Withdrawal with Extenuating Circumstances may impact a student's Financial Aid award. Depending on the date of withdrawal, the Financial Aid Office may require the student to pay back aid already received. A 'WX' will be notated on the student's transcript, which will not impact the student's GPA but will count towards credit hours attempted. A student who withdraws from the university may be entitled to a reduction of tuition and fees. The amount of the reduction, if any, will be determined by the date on which the student withdraws from the University. Click here for the official Withdrawal Tuition and Fees Adjustment Schedule. During the Fall and Spring academic semesters, all existing and future housing assignments are canceled once Housing and Residence Life is notified that a student has withdrawn for any reason. Cancellation occurs because students not enrolled in a class are ineligible for academic year campus housing and are no longer eligible to hold priority future assignments. Upon request, Housing and Residence Life may retain future assignments following review of the documentation provided through the Withdrawal with Extenuating Circumstance process. Students must submit a Housing Cancellation Form to University Housing once they have submitted a withdrawal request form. Students who are approved for a full withdrawal with extenuating circumstances that are released from their housing contract and choose to return in the same academic year must reside back on campus. Failure to do so will result in a charge of fees. Requirements for Summer Term housing are different than those of the academic year. Withdrawals for the Summer Terms are reviewed by Housing and Residence Life on a case by case basis to determine if the student who withdrew continues to meet the eligibility criteria for Summer housing. Withdrawals for Summer Terms do not automatically result in the cancellation of future academic year assignments. Students who withdraw from the University: Students must be enrolled at UNC Charlotte in order to use Student Health Center services. When students withdraw from the University, whether they receive a refund of the Health Fee or not, they are not eligible for services except for one follow-up visit at the discretion of the attending provider for an illness treated immediately prior to the withdraw. Students with Student Health Insurance who withdraw within the first 10 class days of the semester: Students who have the Student Health Insurance Plan and who withdraw within the first 10 university class days will be automatically withdrawn from the Plan. The premium will be refunded to the student’s Student Account and any claims paid will be recouped by the insurance company. Withdraw after the first 10 class days of the semester: Students who withdraw after the first 10 university class days may continue to use the Student Health Insurance but they cannot be seen at the Student Health Center. There will be no reimbursement of the premium even if the student wishes to cancel the Student Health Insurance. Students who withdraw in the Fall will be covered by student insurance until December 31. Students who withdraw in the Spring will be covered until July 31. Students do not have to obtain referrals from the Student Health Center. For questions about insurance, contact the Student Insurance Office in the Student Health Center at 704-687-7435. Students using veteran benefits should contact the Veteran Service Office by emailing veteranservice@uncc.edu. If a student-athlete withdraws from the University they will be immediately ineligible and will be unable to meet NCAA continuing eligibility requirements for the next semester. Send an email to the Athletic Academic Center before withdrawing.